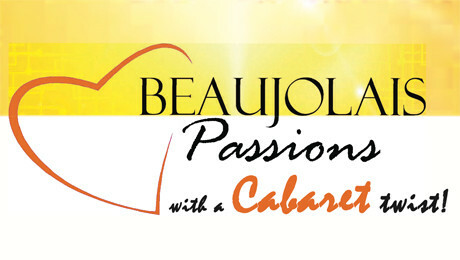 BEAUJOLAIS PASSIONS WITH A CABARET TWIST! The event will feature some great entertainment “à la mode de Paris” with cancan, feathers, glitz and a medley of French talents! Cabaret Versatile – recipient of the Best Cabaret and Variety Show of the Hollywood Fringe Festival, 2012 — will perform its latest revue with amazing dancers choreographed by French lead dancer Lola Ohlala. Also on stage ‘The Lady in Red’ Jenny Eloise Rieu, a French ‘vintage singer’ who will take attendees on journey to a time and place of old world elegance and glamor. A Cabaret would not be complete without a twist of “Las Vegas Style” so Beaujolais Passions producers invited award-winning TV personality and crooner Tony Sacca to perform world renown French tunes such as “My Way” (Comme d’habitude), or “Beyond The Sea” (La Mer). As always, the Beaujolais Passions 2012 edition will be a unique and enjoyable way for Francophone and Francophile attendees to network with influencing decision-makers while wandering through the 'Beaujolais Market Place' that will feature tastings of French culinary delicacies from members of the Club Culinaire of Southern California, exhibitors, a silent auction, and a host of surprises. Ticket price includes: Welcome Glass of Beaujolais Nouveau 2012 at event entrance – Georges Duboeuf Souvenir Glass – Access to Market Place – Live Cabaret Show – Preferred Reserved Seating – 4-course French Buffet – Glass of Wine with meal – Mineral Water/Coffee/Tea – Taxes and tips. Ticket price includes: Welcome Glass of Beaujolais Nouveau 2012 at event entrance – Georges Duboeuf Souvenir Glass – Access to Market Place – Live Cabaret Show.